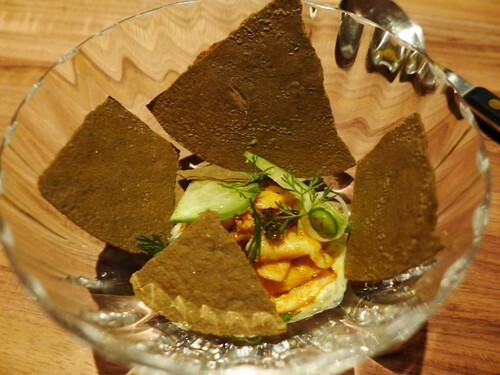 When I knew I would be staying in Mexico City for a few days it wasn’t hard to pick a restaurant: everyone seems to agree that Pujol is one of the best fine dining experiences in Latin America. Within the 2013 San Pellegrino World’s Best List, it appeared second after Alex Atalas DOM in Brasil. The just released 2014 list still places him 6th. 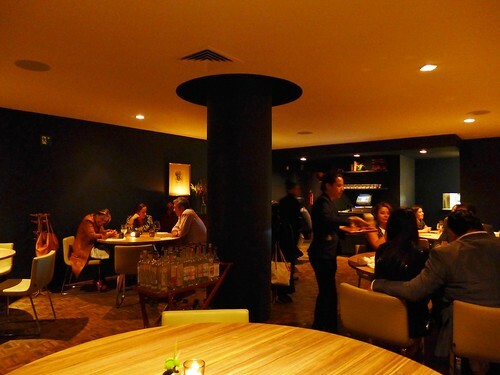 Also, there is no question that chef Enrique Olvera, who just fulfilled his dream of opening a restaurant in New York (Cosme), is the institution when it comes to fine dining in Mexico. This is underlined by the fact that some of today’s Mexican newcomer chefs also have passed through his kitchen. Somehow Enrique Olvera is the first of a new breed of chefs in Mexico trying to include local ingredients and specialties into modern cooking with all its twists and techniques. I first read about Pujol a few years over here on a Life worth eating and had it on the back of my mind ever since. I was curious how a concept of fine dining comprehending Mexican food and ingredients would work out. Is it actually possible to transfer all these good things into fine dining, elevate them? So on that September evening when we stepped out of our cab in the fancy neighborhood of Polanco, we were about to find out. The first impression of the place was a bit mixed, as we had to wait a couple of minutes in a closet-like doorway. (the wooden cabinet in the picture above). Even if it is nicely furnished, this isn’t a waiting room really worthy of a high-end dining place. But well, we’ll be comfortably seated soon right? But as we sat down, we had to realize that there were some more things specifically and generally disturbing about the atmosphere in this place. But maybe it’s just us, who knows?! First, we had a table big enough for seven although we were only a party of three. Second, that table was located right next to the entrance. Further, all the tables were illuminated from above by a really bright spot as the rest of the dining room was immersed in complete darkness. The spots alone were blinding us and the reflection of light on the cloth less table didn’t make it more comfortable. Then, sound reflected on the naked walls, making the room quite noisy. Even if this place is supposed to have a bistro-like atmo, it should be less disturbing than this. But again, this might be only my personal opinion – I’d be glad to hear some other and in the end, we came for the food. Now guess what was the first thing that was offered to us? Right. Mezcal. And of course I played the game. I was able to try a sip of two different kinds and opted for the smoother, less smokier Mezcal, a “La Herencia de Sanchez”. My companions who preferred not to start with hard liquor asked for a glass of Champagne. Unfortunately Champagne wasn’t served glass wise so they had to go with cocktails instead (including a really tasty Mojito). But back to the Mezcal. 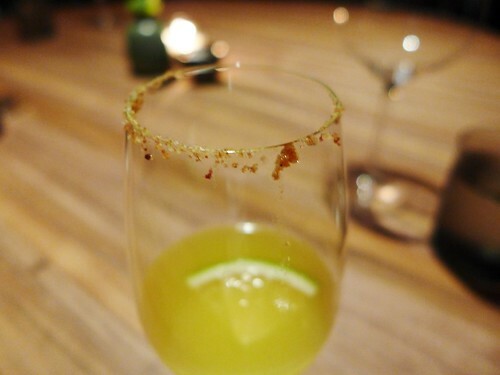 It came with a glass of orange juice with worm salt on the edge which as a whole accounted for a pretty original first taste of the evening for me: the worm salt added a slightly pungent earthy touch to the sips of Mezcal and orange juice. While it was interesting to have a mezcal at the beginning of the meal i have to say that it also added to the disturbingness due to the unfortunate lightning. It didn’t relax me or put me at ease for concentrating on the meal. Next time we’ll share a bottle of bubbly I guess. 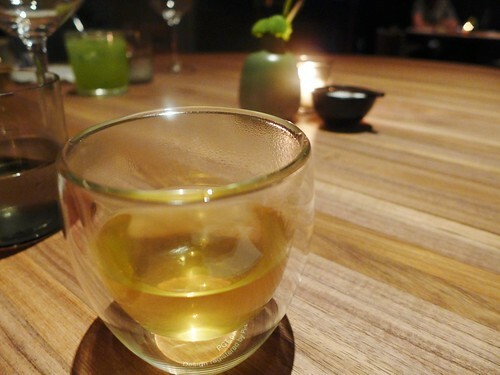 Then a glass of Mexican herbs infusion was served on the side. This one had really nice aromatics, appeared rather savory but also had a sweet edge. I am not sure but I felt like oregano could be one of the used herbs. The menu started with a few so-called “street snacks”. Chia seed and avocado aguachile with worm salt (left) was the first. Baby corn with powdered chicatana ant, coffee, costeno chile mayonnaise. 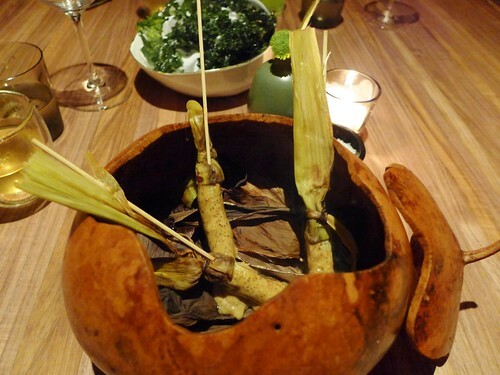 It seems like ants are in fashion in gourmet restaurants all over the world (Noma) but here in Mexico they have a certain tradition – ant eggs are known as a delicacy. Anyhow these powdered ants that are on the baby corn are the first I ever ate. But it was hard to determine their specific taste as the delicate mayonnaise was dominating the sweet corn cob. A certain earthy taste was rather coming from the coffee than from the powdered ants I suspect. 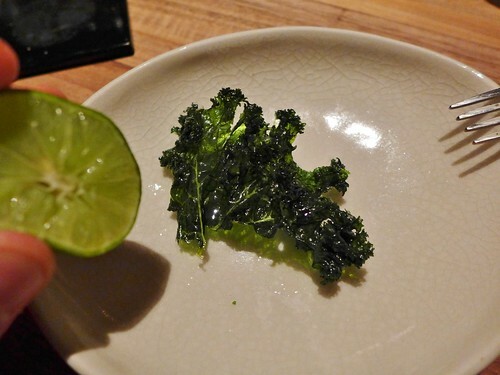 Kale chicharron are fried kale leafs sprinkled with some sea salt. We were asked to squeeze some lime atop right before eating them. This was a delicious one. Crunchy, salty, that little frying taste and a spinach-like greens taste. Often it’s the small things! Wild mussel, chile guajillo, cilantro. A nice little extra that wasn’t mentioned on the menu. 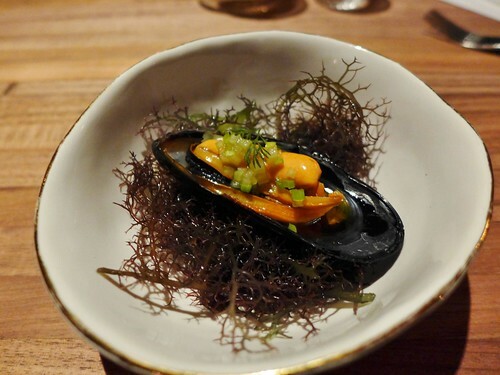 A nice piece of mussel, some crunchy cilantro, a little chili oil. Nothing too exciting but a simple and well working combo. 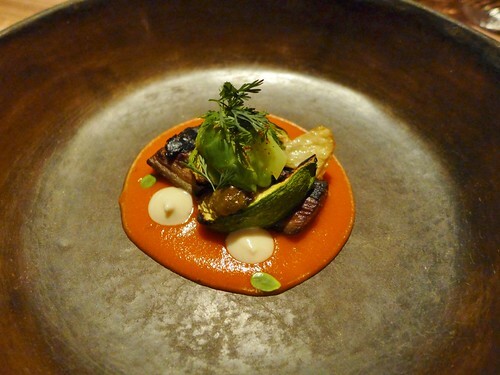 Vegetable mole, eggplant, zucchini, sunchoke. A dish that transports lots o warmth. 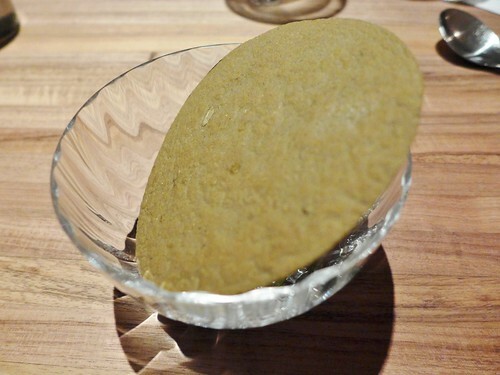 There are earthy flavors coming from the dots of sunchoke purée. The mole has a quite fruity tomato-like taste. When closing my eyes I must think of eating a really good vegetable lasagne or ratatouille-style dish. Octopus, ink tostada, oregano and habanero mayonnaise. A creative take on a tostada which had lots of textural elements with the crunchy tostada to begin with – this I had to burst into pieces. Then there was crunch and acidity coming from slices of an apple-like fruit (couldn’t catch the name) which also worked well with the soft, tender and rich octopus. A nice one. Fried pork belly, purslane, smoked navy beans, radishes. The pork was tender and juicy but literally had no salt except for the few grains that had been put atop before serving. I understood with the next bite that the pork had to be mixed with that little salad which had an intense salty and acidic taste. The combination of the two worked well. It is a nice dish but nothing really spectacular. Mole madre, mole nuevo. This is one of the most “simple” dishes of the evening and at the same time one of the most interesting. 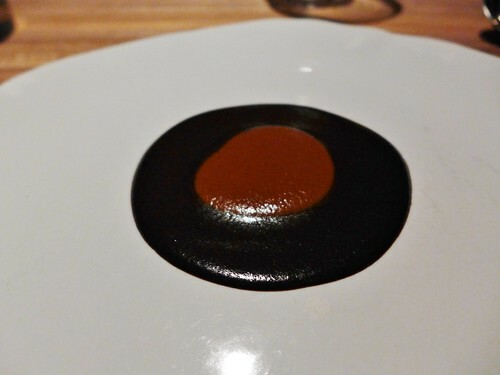 It is a combination of two moles, two typical Mexican sauces. The one in the middle is young. It has a fruity and more spicy taste, more straightforward than complex. Then there is the ring of dark sauce, the old mole. It is actually one year old and has an incredible depth of flavor. It is a little grainy has intense earthy notes but also reminds me of coffee and somehow I have to think of incense as well. The layers of flavor seem to multiply and it is very long lasting – 1 minute at least. This is an impressive dish and a genuine cultural statement of what Mexican cooking is capable of. Brioche with Brie cheese. Cheese with marmalade is an evergreen and this small bit works well. 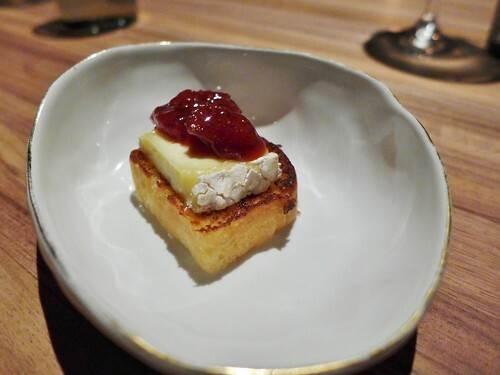 The rich brioche has a piece of well-tempered aged brie on it which is topped with a strawberry and mint marmelade. Tamarind, tejocote, hibiscus ponche. The dessert was a really good one. 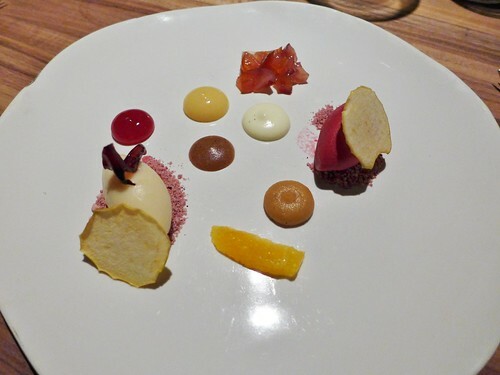 A fresh and fruity mix with guava sorbet, hibiscus sorbet, tamarind purée, apple chips, hibiscus ponche jelly and tejocote which is a unique Mexican fruit, some kind of hawthorn varietal. Kudos to the pastry chef! So let’s leave the atmosphere issue behind as a personal preference thing and talk about the food only. Some dishes impressed more than others but they all had, as expected, a strong Mexican edge to it. 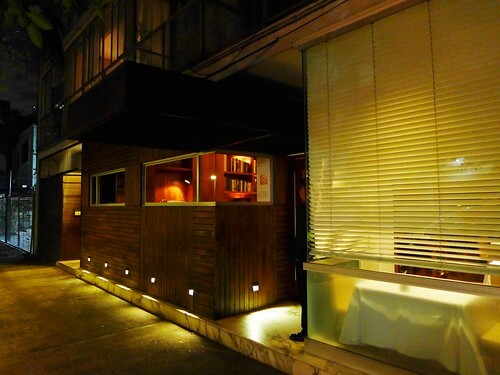 So rather than a typical modern fine dining restaurant Pujol is a cooking lab for modern Mexican cuisine. Enrique Olvera reinvents and reinterprets classic Mexican dishes and also demonstrates the large variety of the Mexican food landscape, from meat to vegetables via seafood. 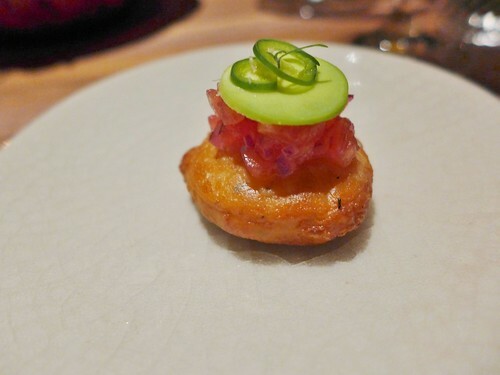 But one can also tell that either fine dining might still be in its infancy in Mexico or that there are currently limits to transposing dishes and ingredients to a certain level of creativity and refinement. Another reason might be that Olvera doesn’t want to go too far away from the traditional dishes and still wants them to be identified in his creations. 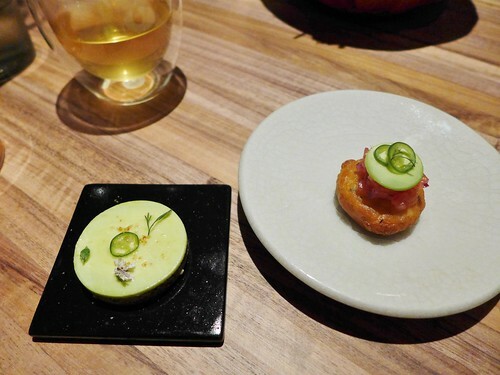 Well, if you’d asked me to apply the Michelin star scale to Pujol, I’d give it 1 star. 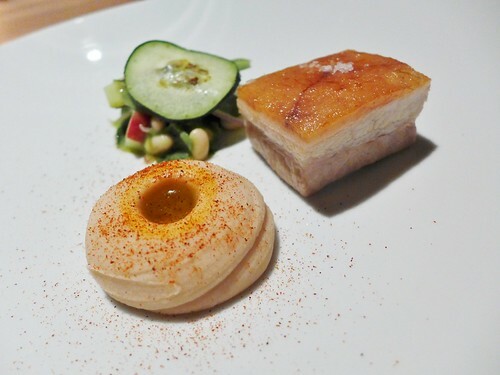 Dishes such as the pork belly or the tostada just lack in refinement to reach another level. My star of the evening was the dish with the 2 moles. And I think these are the kind of things that need to be used in other dishes as well. Anyhow I am curious how the scene in Mexico will develop in the coming years.